Few days ago we had few friends over at our place for dinner and chit-chat. It was due for a long time. My friends wanted to have indian dishes, so I prepared few traditional dishes myself. I was still cooking when they arrived. After I finished putting together everything, I went to freshen up. Eventually, we started discussing about the daily skin care, moisturizer, day/night creams that we are using. That was the first time, I mentioned to them about "The Body Shop"and that was the first time I realized none of them are actually aware of this store. 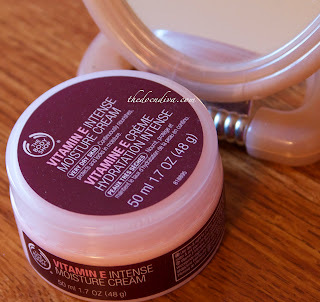 I am totally in love with their skin care products since I was in England, especially the vitamin E line. So, it was kind of shocking to know that even my close friends never heard of the store and struggling to find suitable products for their skin types. 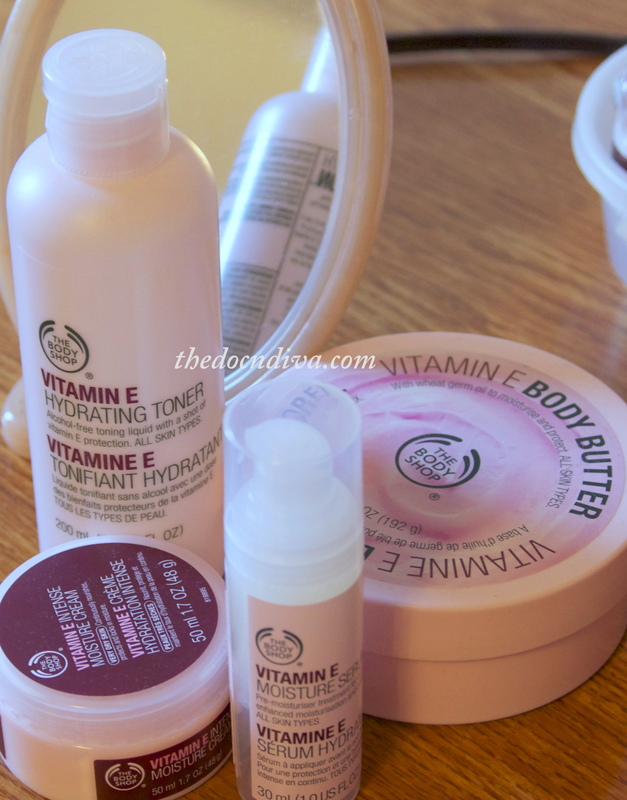 The body shop caters all types of skin, dry to normal to oily. My skin type is normal to dry and vitamin E line (they are for all skin types) suits me amazingly. I have been using vitamin E intense moisture cream, and vit E moisture serum for last three years as my daily moisturizers and intense moisture cream as night cream too; and vit E body butter, and vit E hydrating toner for more than one year now. Honestly, I like all of them, but I LOVE the intense moisturizer and the serum. You might get a false perception after seeing the density of the intense moisturizer cream, but it is amazingly blend-able and after blending on your skin, you will feel like you are wearing a very light cream. The smell is very soft; so if you have any smell allergy, you might still want to give it a try. The serum is much more oil free than the cream, so, if you want a oil free, gloss free moisturizer that still does the job on your face, serum is for you. Again, smell is very light. 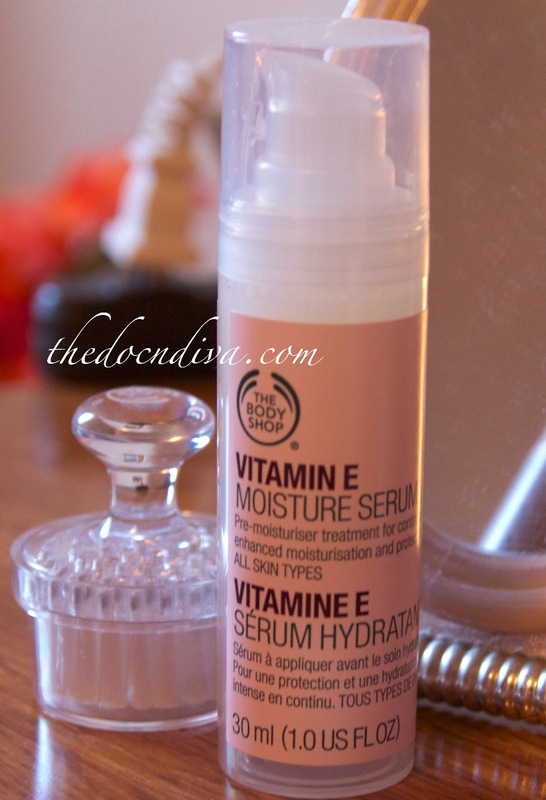 Honestly, I use the serum mostly during the summer and the cream during winter. To conclude, I HIGHLY recommend both the products for all seasons as MUST haves. My husband has sensitive skin and he has used their Aloe vera line for sensitive skin. These are good too and my husband's skin seems to tolerate them well. $25 off purchase and free LYB membership renewal for 8 reward points (you can always check the link for detail terms and conditions). So, go ahead and try out some of these amazing skin care products. Please feel free to share your experience of using the kind of skin care items you use. Disclaimer: This review is the result of my personal experience and not sponsored by the company I mentioned here. It is of-course your decision whether or not you want to try these products. Happy skin care.